The ALMA radio telescope is currently the world’s most powerful yet in recent months some experiments were carried out that made it even more powerful by working together with other radio telescopes to create a virtual instrument that may have a size similar to that of Earth. This was made possible by combining observations from ALMA with those from other radio telescopes located in other continents. The technique used to carry out those experiments is called VLBI (Very Long Baseline Interferometry). The baseline is the distance between the two telescopes that work together to form an instrument as large as the distance between them. This allows to obtain results that can be much better because the larger the size of the instrument, even if only virtual, the greater the magnification that can be obtained. To be eligible for this type of observations, ALMA (Large Millimeter/submillimeter Array) was to be completed and have all of its 66 antennas active. In this way, the resulting array may work like a single parabolic antenna for the reception of radio waves with a diameter of 85 meters. ALMA was officially inaugurated in March 2013, when it could already work with a part of its antennas active. In the following months, the array was completed and tested. At that point, it was possible to include ALMA in a virtual telescope using the VLBI technique. These experiments had among their goals to verify the feasibility of the Event Horizon Telescope (EHT) project, which aims to work with a worldwide network of radio telescopes working in the millimeter wavelengths. The idea is to use ALMA as a sort of heart of EHT, which will work as a radio telescope the size of the entire planet. It will have a enough magnification possibility to observe the details of the area in the immediate vicinity of the supermassive black hole at the center of the Milky Way. The first experiment was performed on January 13, 2015, when ALMA got linked to the nearby Atacama Pathfinder Experiment telescope (APEX), which is only about 2 kilometers from the center of ALMA’s array. The resulting radio telescope was used to observe a quasar known as 0522-364, used for tests in the field of radio astronomy because it’s particularly brilliant. On March 30, 2015 the second test took place, more important because ALMA got linked to the Institut de Radioastronomie Millimétrique’s (IRAM) radio telescope in the Sierra Nevada, Spain. In this case, the object of observation was the quasar 3C 273. The American MIT (Massachusetts Institute of Technology) participated in the experiment by receiving signals of the two radio telescopes to combine the data. 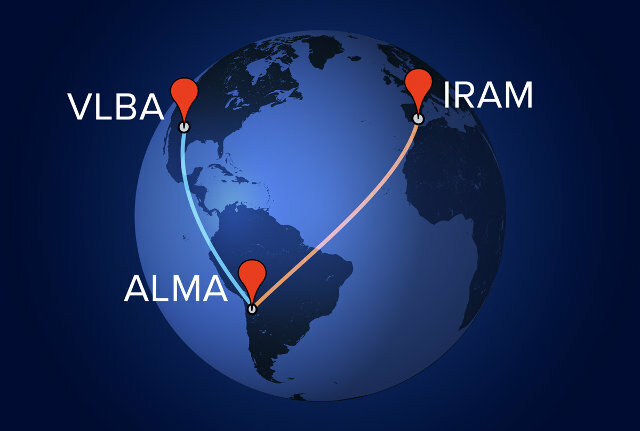 The third experiment took place between 1 and 3 August 2015 linking ALMA with eight of the ten antennas of the National Radio Astronomy Observatory’s (NRAO) Very Long Baseline Array (VLBA). The quasar 3C 454.3 was observed, one of the greatest radio wave beacon in the sky. Again MIT participated, together with the Max Planck Institute for Radio Astronomy (MPIfR) in Bonn, Germany. The experiments were successful, important steps in the EHT project. In the coming years, the cooperation among various observatories and other scientific institutions will allow to take further steps forward in astronomical research that will bring progress in the field of physics as well. There will be also technological advances thanks to developments made to implement this project.